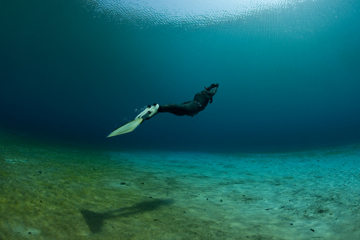 In the RAID Advanced Freediver course you acquire the Proper skills and knowledge to partake in Freediving to depths of 30 meters in the most relaxed and safest manner possible. You will develop skills necessary to train your body to be more efficient with oxygen, gain better respiration and muscle flexibility and learn new skills to explore your Freediving potential to the maximum. This is where the theroy goes into practice, more advanced techniques for Freediving that you will use for a lifetime are developed during the confined water sessions, relaxation and managing stress, Advanced techniques like No-Fins and Static Apnea training, the buddy system and safety are all covered, the confined water sessions are like an open water simulator, this gives you the chance to become comfortable with the Freediving skills before taking them to Open Water. Certified RAID Freediver or equivalent.